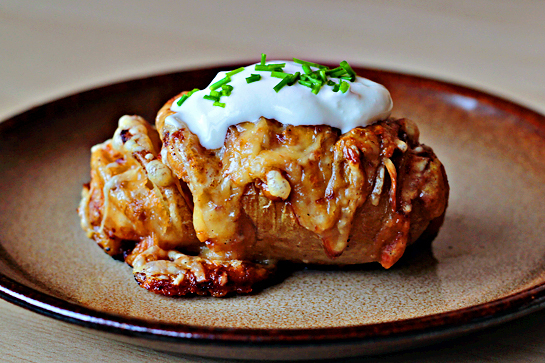 They are fancy baked potatoes. They are fun to make and they are fun to eat too. They are full of butter,cheese, and cream deliciousness. 1. Preheat the oven to 400 F (200 C). 2. 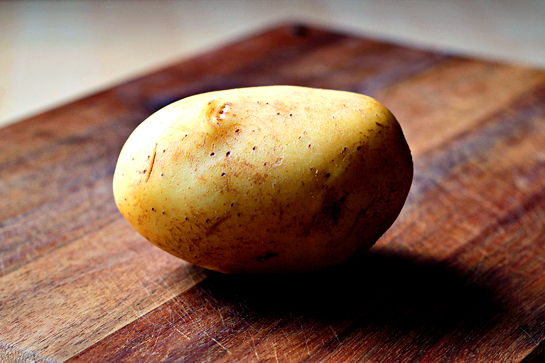 Scrub the potatoes clean. 3. 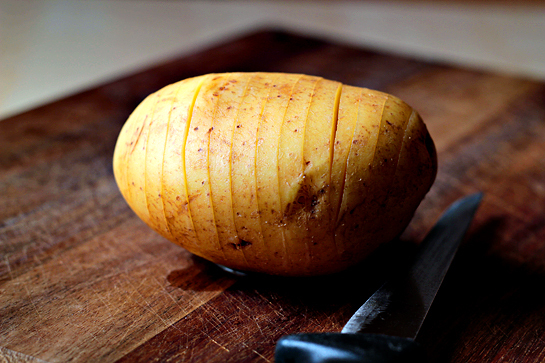 Using a sharp knife, make slices across the potato, being sure to stop before you reach its bottom. 4. Slice the butter and Parmesan. 5. Next, open the potatoes’ crevices and shove the Parmesan and butter, alternating between the two. Tip: It helps to put butter in freezer for awhile before cutting it. 6. 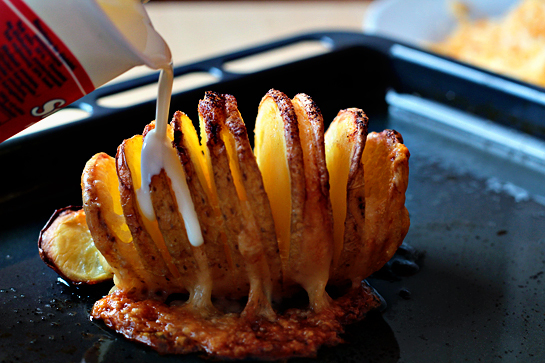 Transfer the potatoes onto an oiled baking sheet and drizzle a little oil on top of the potatoes. 7. Season with salt and garlic powder. You can be quite generous with salt. 8. Bake for about 60 minutes. 9. After about 45 minutes, remove the baking sheet from the oven. 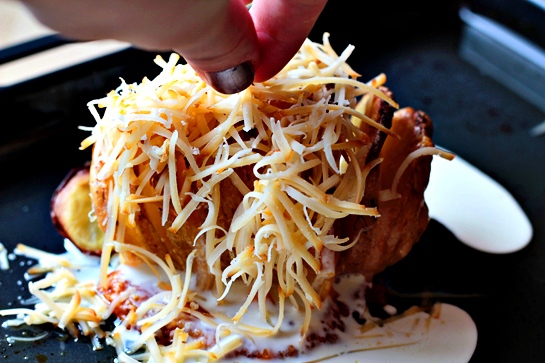 Drizzle cream over the top and top with grated cheese. Any cheese you like. 10. Return the baking sheet to the oven for the last 15 minutes. And here it is, the precious little baby. You can serve it with a dollop of sour cream, it makes a nice flavor combo. And this is what our lunch looked like today. 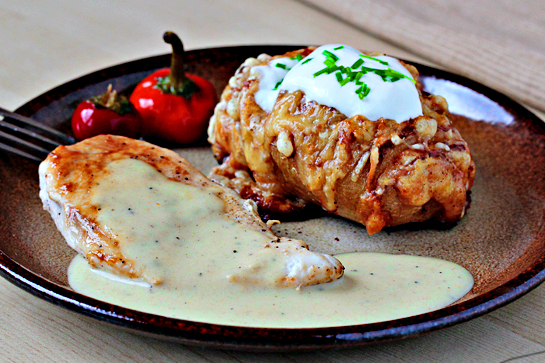 Scalloped Hasselback Potato with chicken and a little gravy. Yummy! This looks delicious, fabulous comfort food! I can’t believe I’m the first one to comment. Looks and sounds like a remarkable side-dish. Gotta try it! I suppose the parmesan was used because it holds up longer to the oven heat, its flavor bonding with the potato rather than instantly melting down to the pan? Wonder what a substitute might be? 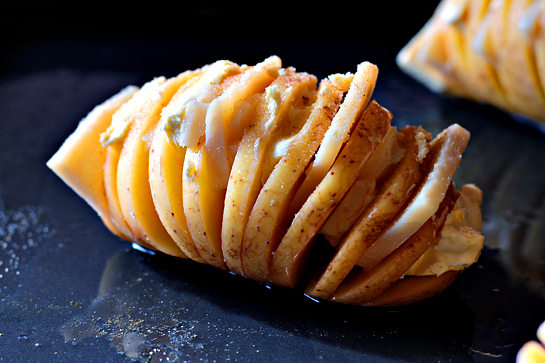 I have made Hasselback potatoes for over 40 years. But I have never made them like this! Am going to fix them like this for my Valentine this year. This recipe gives me some other ideas for them also. I love this recipe. One thing I have found that helps on the third step is to place two chopsticks on either side of the potato – that way you won’t chop all the way through the potato. What a simple yet super delicious sounding and looking recipe. I will try it tomorrow. I’m sure it will be very yummy. Thanks for the recipe! @Mike – You’re going to slice open your Valentine so you can insert cheese & butter? I can’t see that ending well. G’day from South Australia & YUMMY to your wonderful site here!! I saw this recipe picture on Facebook under Creative Ideas…..cannot wait to try it this week as its great winter food. Thanks for the recipes and other creative ideas!! Will and have pass on the info and your website here!!! ‘Love all your work, thanks for sharing!!! What does the Heavy Cream do? This looks absolutely divine! I will make them for my husband’s birthday next week. I tried this and it tasted quite good. But is there a way to deal with the puddle of half-burnt butter/grease? Am I doing something wrong? I’d just line the pan with foil, let it catch the burnt grease, then toss the foil. Save a ton of time in clean up. OMG that looks SOOOOOOOOO YUMMY!!!!!!!! 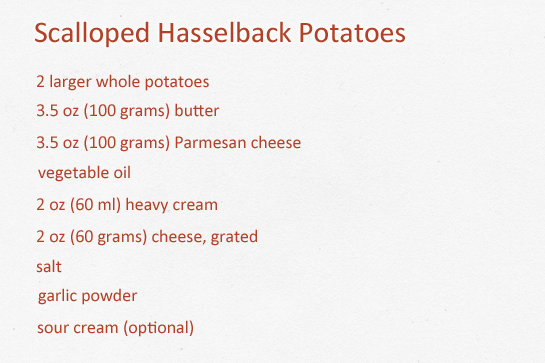 Looks really delicious and easy to make, I just wish they weren’t called “Hasselback”, nobody wants a serving of right wing extremism with their meal. How did you make the chicken and gravy in this picture? It looks delicious! I love how the potatoes completely fell apart when we tried to get the cheese and butter in.